For other uses, see Glass Mountain (disambiguation). ^ a b c [" http://www.okmajordev.org/gloss-mountain-state-park.html> "Major County Economic Development Corporation." Accessed February 24, 2016. ^ a b c d McPhail, Melanie L. and Richard A. Marston. Encyclopedia of Oklahoma History and Culture. "Glass Mountains." Retrieved March 5, 2015. ^ "Glass Mountains Oklahoma." Geocaching blog. Accessed February 22, 206. ^ Benjamin Propelka. 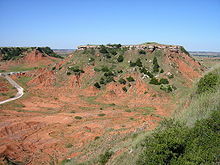 "Scenic USA - Oklahoma: Gloss Mountains State Park." 2012. Accessed February 22, 2016. ^ Thomas, Phillip Drennan. "James, Thomas (1782-1847)." Encyclopedia of Oklahoma History and Culture. Accessed February 22, 2016. ^ Burchardt, Bill. 1970. "The Glass Mountains: Our Treasure in Trust." Oklahoma Today. 21(1):29-38.